Pinwheel UFO top is now finished! I started this UFO this past October .. about 2 months on the calendar. I do apologize for the weird photo. My sewing room isn't very wide and I needed to use a wide-angle lens on my cell phone to get the entire quilt in the frame. It's from a pattern called "Pinwheel Quarters" by Mary Jane Best. I had a number of her patterns in my UFO bin. This particular series was designed to take advantage of Fat Quarters ... a new concept in pre-cuts at the time (circa 1995). Additionally, the patterns are written with the brand new quilter in mind .... which tended to drive me nuts. However, having worked with a number of her patterns already this year, I could see that all I really needed was an entire boatload of pinwheels, which meant more than an enormous amount of half square triangles. When I need a LOT of half square triangles all made from the same fabric, I like to use the strip grid method. 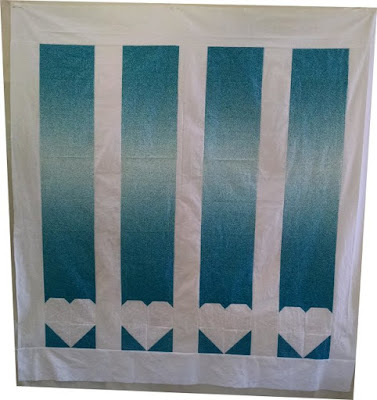 My quilting friend, Jan Wickell, has written a tutorial about this method and it's the one I used for this quilt top. 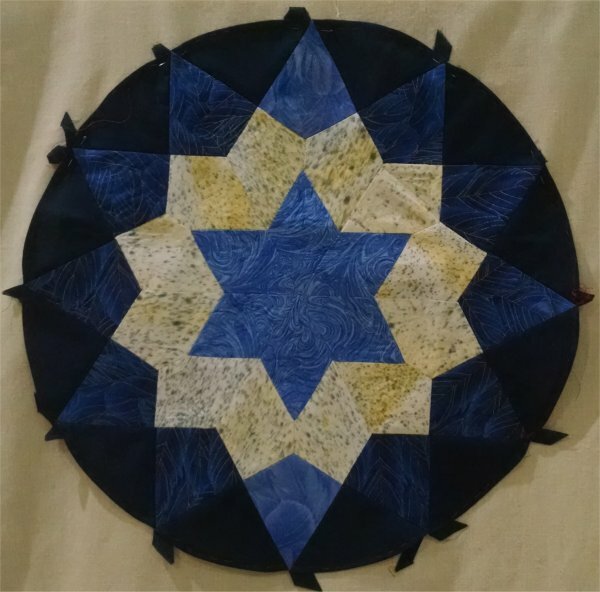 The reason I chose this pattern is because I had a bunch of half square triangles/pinwheels left over from a previous project. I wanted to use the leftovers up. Oh, and let it not be said that I'm not ambitious! 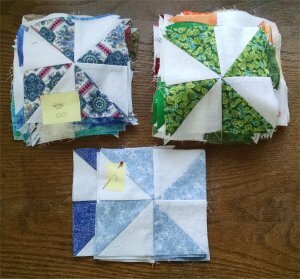 Now, I could have used the leftover pinwheels for a smaller quilt (this pattern allows for two sizes: 45"x55" or 50"x60") but oh no! not me! I like BIGGER quilts. All I needed to do was make MORE half square triangle pinwheels! What could be more simple? (I'd insert of video of my banging my head against the wall but I neglected to film it). MILLIONS of half square triangle later ... and THOUSANDS of pinwheels later ... I finally made all I needed for this bigger quilt top. How much bigger? Well, it finished at 70"x95" .. which is inconveniently between a twin and a double. Obviously, my math was somewhat incorrect in my calculations. BUT .. it is what it is and that's the size it's going to be! I'm not majorly thrilled with the placement of the colors ... and I must take full blame for that. The pattern doesn't specify what colors nor how many of each color nor how to place the pinwheels once they've been constructed .. you're kinda on your own. Which is a horrid place for *me* to be when it comes to random placement of color ... or deciding what the heck I should do with the colors that I have. 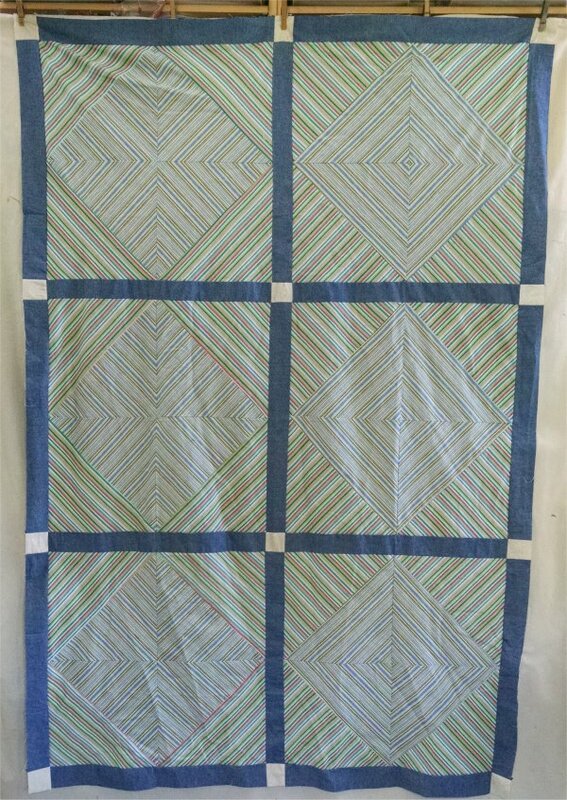 I made a mock-up in Electric Quilt to get a feel for where the colors should go. I was constrained by the fact that I had a certain number of colors ... and that was it. 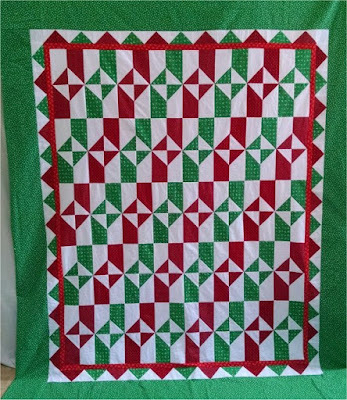 I needed to use what I had (because I sure wasn't going to make any MORE half square triangles or pinwheels!) I probably should have taken more time just to look at the color placement .. maybe parts of it wouldn't have been so blocky. But .. eh .. shrug ... I was impatient to get the top sewn. 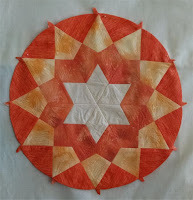 I'm continuing working on my current Forever Project™ .... Esther Aliu's "Stash Busting Stars". I've finished star #6. Only 3 more full-sized stars to go! (and then 4 quarter stars and 8 half-stars). The half-hexies were leftover from some long-ago project .. one that I can't even remember at the moment. I'm glad that I tucked the instructions for the half-hexie Friendship Braid along with the fabric because I probably wouldn't have remembered what I had planned to do with them! Having said that, I got bored with the braid and decided that I was done with it ... it ended up slightly smaller than a twin size. But I still had more half hexies to use up. Initially, I had put the halves together to form a whole hexie and simply smooshed them all together but I wasn't feeling the love in that particular layout. Part of the problem is that I had originally cut the half hexies with the intent of making the Friendship Braid ... and you don't need pairs of half hexies for that; they are used as singletons. So, when I decided to pair them up to create whole hexies, I found myself in a pickle .... I really only had a few whole hexies to work with and furthermore, of a very limited palette. 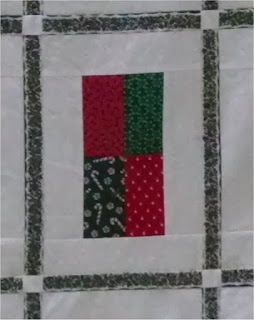 But, I soldiered on .. and found a staggered layout that I really liked at a local quilt show. 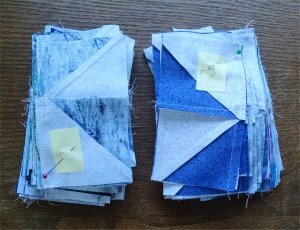 Once I got home from the quilt show, I disassembled the smooshed together hexie layout and began to work on the staggered layout. No pictures right now because it's most definitely a work in progress. Also in-progress is my pinwheel quilt. I had some 5" pinwheels leftover from yet another quilt and wanted to use them up. Naturally, this entailed me making MORE 5" pinwheels from 2.5" half square triangles. Oh Lordy .... it seemed like thousands of half square triangles! But, I've finally finished with all 264 pinwheels .. they've all been sewn together but I ran out of white-on-white fabric, which is used in the outer borders. Drats! 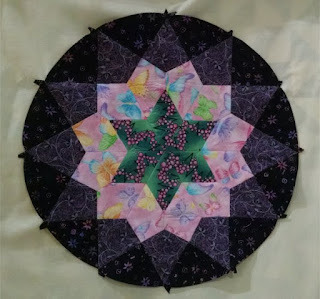 My current EPP handwork project is Esther Aliu's "Stash Busting Stars". It produces a VERY large ... 21" diameter star .. that is set into a slightly larger background square. All I'm doing right now is making the stars. I'm deferring the decision for the background until I have all the stars made and I can see what sort of fabric would be suitable. When I was cleaning out and reorganizing my sewing room, I rediscovered a juvenile jungle panel. During some foray around the internet at some point, I found a freebie pattern for a panel print that had a very interesting border. I printed off the picture and saved it for some appropriate project. Well, when I rediscovered the jungle panel, I knew that the freebie pattern border was precisely what I was going to put around it. And voila! Another UFO bites the dust! except ... 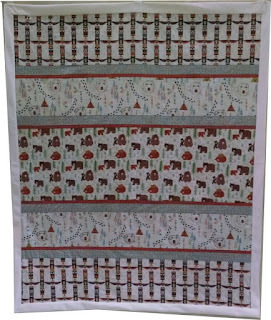 I *know* have a little bit left of the polka dot outer border print. It's enough to make bias binding. Do you think that I can FIND that leftover piece??? I only finished it THIS MORNING, fer cryin' out loud!! Where on EARTH could I have PUT it??? To say I am annoyed is a vast understatement. Harumph. It'll turn up ... eventually. 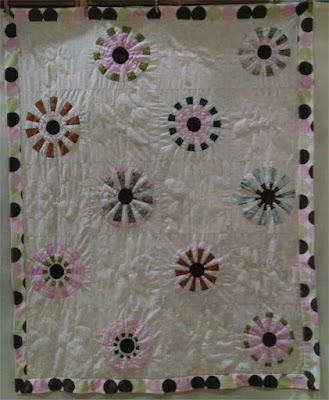 The current UFO that I am working on is a pattern called "Pinwheel Quarters". 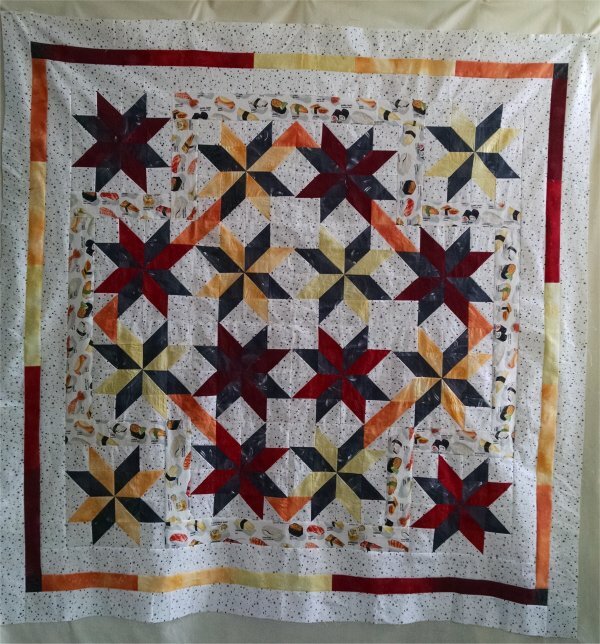 This is another fat quarter friendly quilt pattern by Mary Jane Best of American Legacy Quilts. 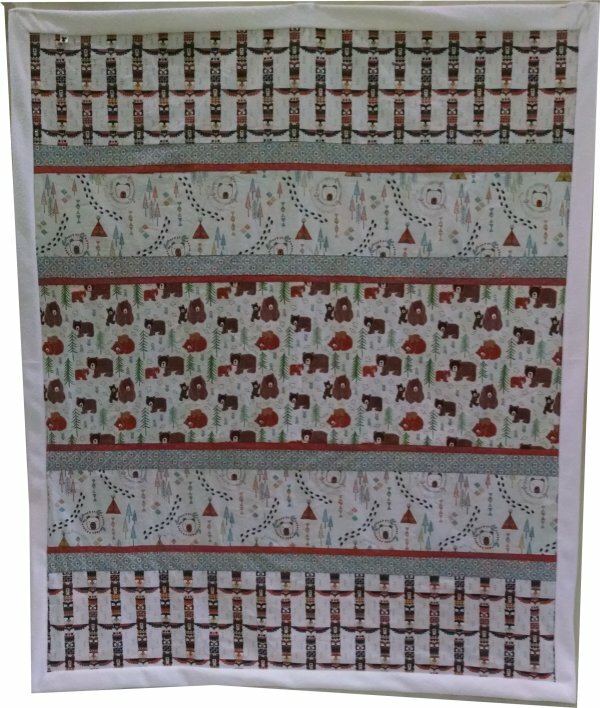 If you use just the fat quarters listed, you'll get a 45"x55" or a 50"x60" quilt. I had some 5" (finished) pinwheels leftover from a previous project. 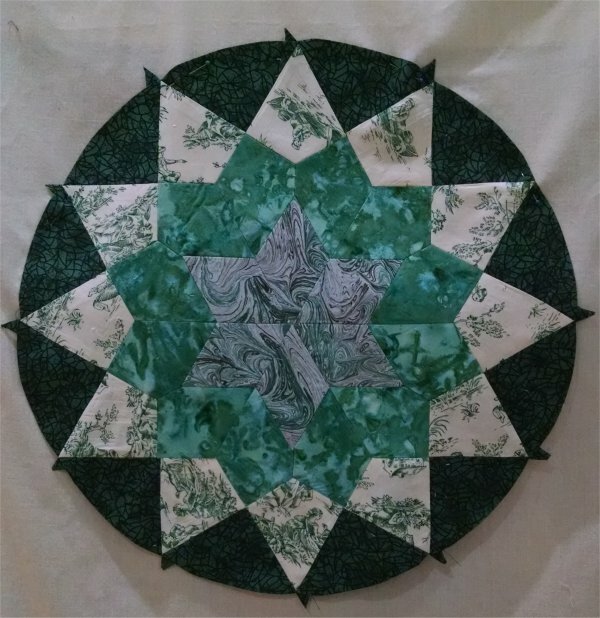 I realized that I could use the Pinwheel Quarters layout, make more 5" pinwheels (so as to use the leftover pinwheels) and make a pinwheel quilt any size I wanted. Since I tend to like bed sized quilts, I opted for a double/full ... which, if my math calculations are correct, means I will need about 264 pinwheels. Oh my. 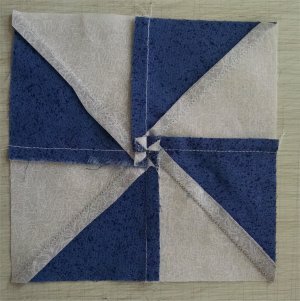 In order to make a LOT of pinwheels out of the same fabrics, it is more efficient and less tedious to make the half square triangles using the grid method. Although this *specific* tutorial has you make a strip at a time, there is another method where you make up an entire rectangle of a grid, resulting in an incredible amount of half square triangles with very little effort. But, I used the strip grid method. It was easy enough to either find an appropriately sized strip or cut a single strip from my stash. To get my 5" (finished) pinwheels, I start with a 3.5" strip of colored fabric and white fabric. Using the grid method tutorial linked above, I mark 3.5" squares on the back of the white fabric in gray chalk. Opposing diagonals are then chalked in the squares. 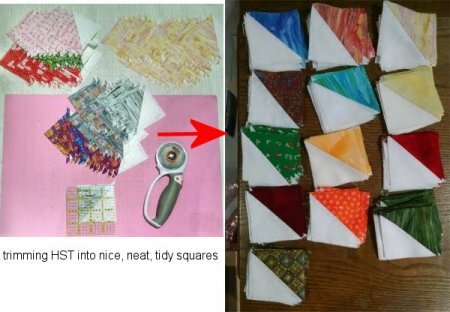 After sewing and cutting apart the squares, the resultant half square triangles are trimmed to 3" squares. I like to make my half square triangles just a tad larger than needed so I can then trim them down to the exact size I need. I have NEVER been able to sew them so that they end up precisely the correct size without trimming. Yes, the trimming is another step, but when done, I *know* I have half square triangles that aren't going to fight me when sewn together. 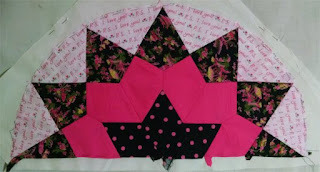 The half square triangles are then sewn into pairs and pairs into pinwheels. The pinwheels are really just fancy 4-patches. When you press the seams for a 4-patch, if you aren't aware of this little technique, you will end up with a HUGE lump at the center intersection. What technique is that, you ask? I don't know if it has a particular name, but I call it 'the swirl'. I've also heard it called "spinning". I certainly didn't invent it but whoever did, is a certified genius. :-) Here's a very good, if very detailed tutorial. The actual swirling/spinning the intersection is about 3/4's the way down the page. BUT ... I have 157 completed pinwheels and 57 half square triangles (that's 14 more pinwheels) already sewn. That's OVER HALF the number of pinwheels that I need! woo hoo! I've passed the tipping point! The saving grace about making the half square triangles with the grid method, is that it's mindless. I can have a TV show or movie going while sewing and I really don't need to pay strict attention to the sewing! It's well beyond time that I documented the projects that I've been working on. I have continued to work on my UFO bins. I am overjoyed to state that I have FINALLY emptied one UFO bin!! Can we all shout, "Hallelujah"? :-) Sadly, I didn't note when I started on that specific UFO bin, but it's now empty. I wouldn't be surprised if I had been working on its contents for a year or more. Most of the contents have transitioned from being UFOs to "tops waiting to be quilted" but some have actually been made into completed, proper quilts. *AND* another completely full UFO bin has been opened up. 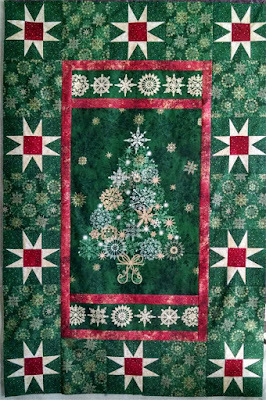 Originally a free pattern at Blank Quilting, it is no longer available there nor at the designer's site, Ranae Merrill Quilts. However I finally was able to find it on an archive site, ... so download it now, if you like it. Not only did I like the graphic aspect of this pattern, it uses ombre (gradient) fabric, which I absolutely adore. Most patterns have you cut up big pieces of yardage into little pieces which you then sew back together in attractive patterns. Doing that with ombre fabric completely defeats the visual aspect of the shaded fabric, so I have waited patiently .. and looked constantly .. for patterns that would properly feature gradient fabric. "Beyond Horizons" achieves that magnificently! 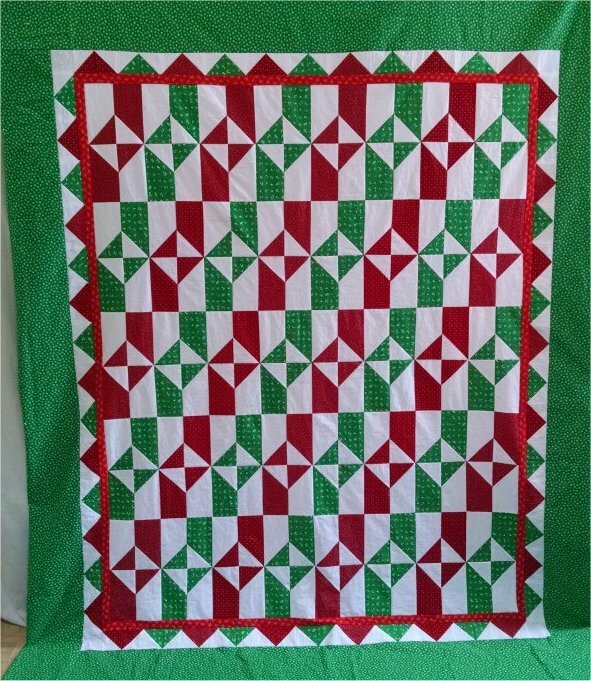 This pattern was given to us by the Dudes during a quilting Retreat I attended last February. Typically, this pattern would have been made with strip sets but Ray (one of the Dudes) was showing us shortcuts to patterns by using striped fabric. Naturally, *HIS* striped fabric was absolutely perfect for this layout. I knew I had striped fabric at home (I like to use it for bias binding) so I declined to buy more at the time. When I looked through my stash of striped fabric, I realized that my taste in stripes wasn't reflected in the kind of stripes that Ray was using. His were very uneven stripes, varying not only in color but in the width of the stripe. Mine most definitely were not. However, I was not going to be deterred ... I chose a stripe that I had a lot of. Unfortunately, it turned out to be So Very Bland and I am majorly disappointed in it. Let me state .... this is a fault of the fabric that I used, NOT the fault of the pattern! 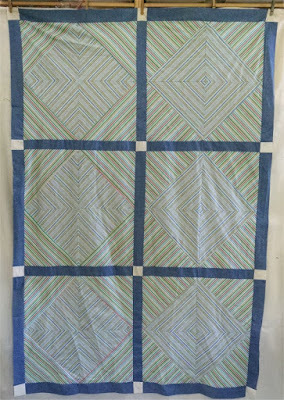 No matter that it is Very Bland, as a donation quilt, it will serve its purpose admirably. Mr. Pirate & I had obtained a new-to-us, small travel trailer in February. After working on it for safety issues, our first major trip was to the Pacific Northwest coat ... Oregon, Washington and, while we were there .. British Columbia, Canada. One quilt shop we visited in Vancouver, BC was a small shop (I mean VERY small) called The Cloth Shop on touristy Granville Island. Such a delightful little place, it's chock full of fabrics that I haven't run across elsewhere. One kit for a small blanket was bundled with Canadian themed fabrics. It was exactly what I was looking for during this trip ... fabrics representative of the area we were in. The pattern itself is simple as can be .. just strips of fabric, in varying widths, sewn together to create the top. Nothing fancy at all ... you're letting the fabric do the speaking for you. Once I got back home, I paired the sewn-together strips with a faux fleecy "sheepskin" to create a self-mitered blanket. 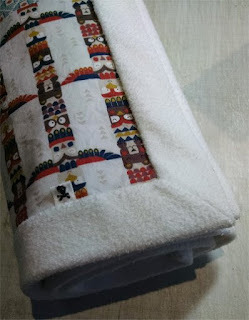 It's a nice is throw when you're sitting in a chair or on the couch ... or ideal for a baby's or toddler's blanket. This free pattern came from the Moda Bake Shop. It's another great pattern to showcase gradient (ombre) fabric. The fabric I used was one of my "vintage" pieces from my stash .. Pointillist Palette by Debra Lunn & Michael Mrowka for Robert Kaufman Fabrics, circa 1995. My fabric started with the darkest shade at both selvages, fading the colors until it was lightest in the center. 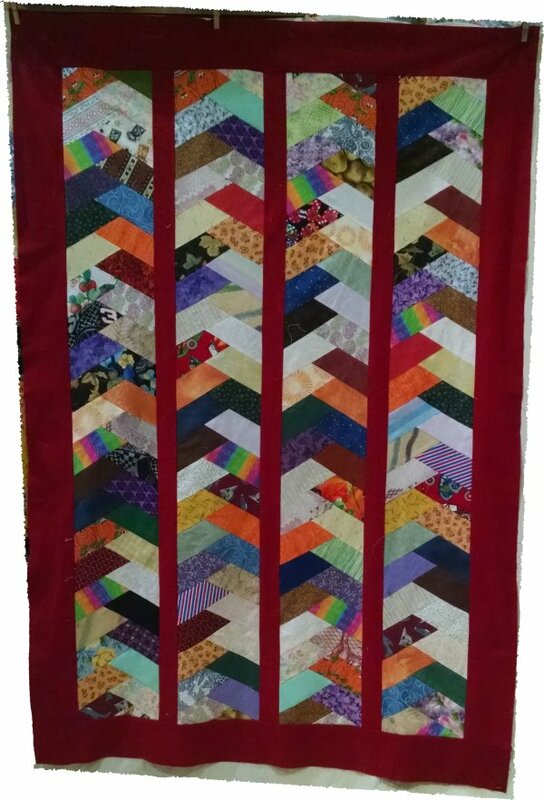 I used the full width of fabric for each column of this quilt, so as to best use this striking fabric. The Pointillist fabric I see now (circa 2016) doesn't have that kind of gradation .. the ones I've seen go from dark to light (or shading from one color to another) in one direction only. This Christmas fabric top was made from the inventory of my dear sister-in-law's mother. Her mother passed away last year and my SIL asked me to help sort through the sewing room. Since my SIL doesn't sew at all, she said that I could have anything out of the room that caught my fancy. Items that I didn't take would be disposed of elsewhere. 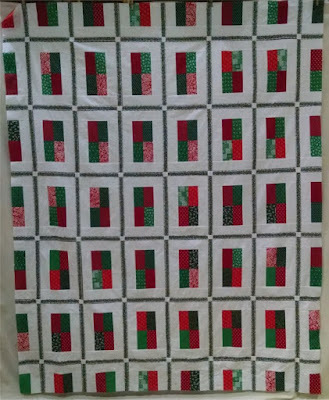 I asked my SIL if she would like a quilt made from her mother's fabric and this is one of them. 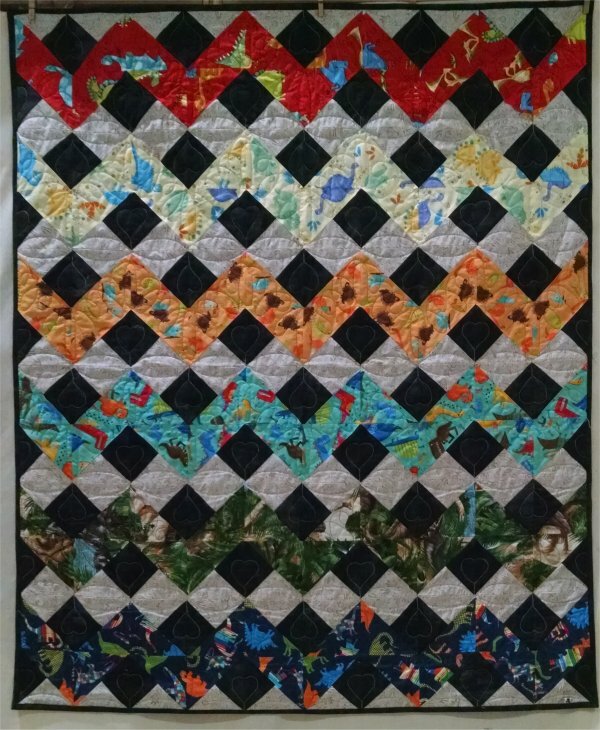 The pattern I used is called "Fat Quarter Twist" by my quilting friend Patti Laird, through her Etsy shop, Sleeping Cat Creations. My border treatment varies from that in the pattern. It is *also* known as "Portuguese Tiles". * City Slicker by Highway 10. The pattern for this top came from Highway 10 Designs Etsy shop. What's unusual about this pattern is that there is *no* border. Obviously you could put on one, but I rather liked it this way. This is another top that I made from my SIL's mother's inventory. One piece of fabric was ribbon stripes. They were printed in such a manner that I could cut them apart and use them as the sashing between the blocks. * Minnie Mouse is Senia's BFF. Mr. Pirate has an adult niece with a 2 year old daughter. 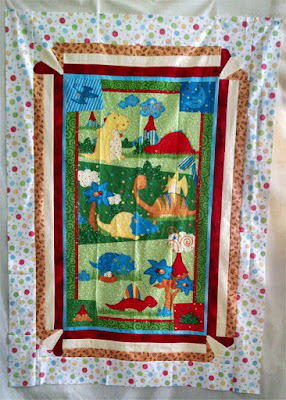 The niece asked if I could make a quilt specific for the crib that her daughter sleeps in. Well, gosh. That wouldn't be any problem at all! The daughter loves Minnie Mouse and not having any in my stash, I scoured the internet and scooped up a number of Minnie Mouse themed fabric. I found a free pattern, "Dresden Window Pane" from The Stitching Scientist. I modified it to fit the required finished size of the crib. The original is more square; Senia's is obviously rectangular. As a result, the square blocks of the original necessarily became rectangles in my version. I also machine embroidered Senia's name in the middle of the Dresden Plate. 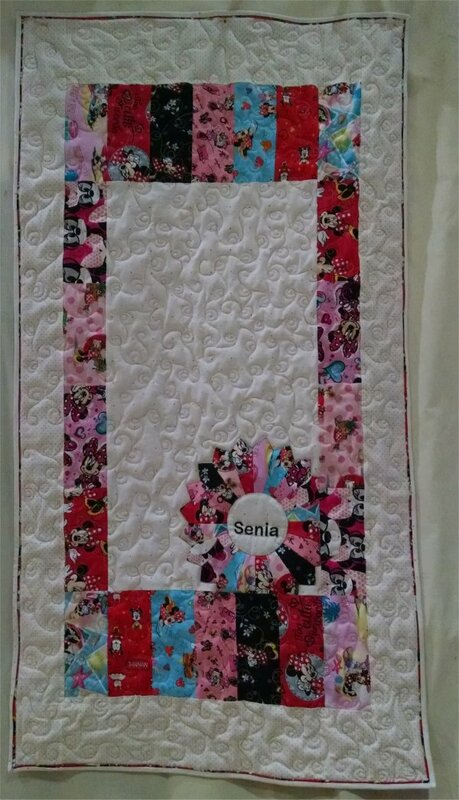 For quilting, I did an all-over meander of double-loops, SITD around the Dresden Plate, the center circle and Senia's name. I honestly don't know what comes over me to start NEW projects when I have oodles of UFOs waiting to be worked on. But since I "discovered" EPP, I have become enamored of the process. However, I have also become rather weary of hexagons, having made enough to encircle the earth, I'm quite sure. This project is a creation of Esther Aliu, which she calls "Stash Busting Stars". 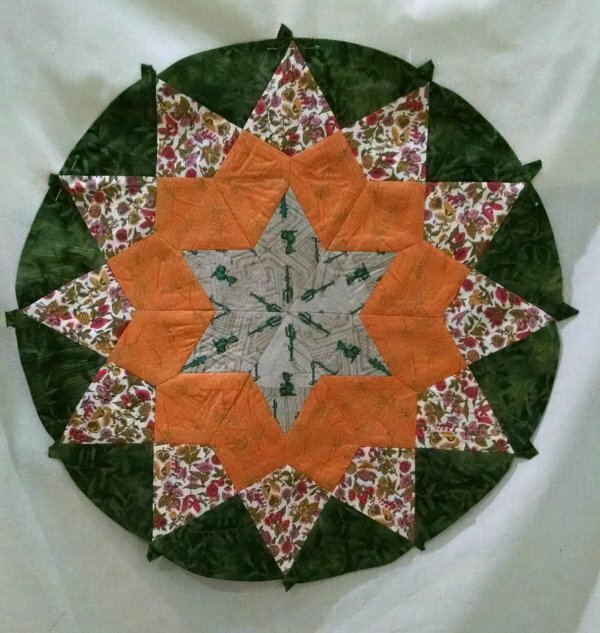 Now while her pattern creates a HUGE circular star that does use up scraps from your stash, to my way of thinking it *really* doesn't "bust your stash". 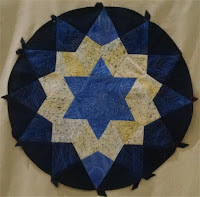 That's OK because the star blocks are simply beautiful and you can create all sorts of different looks, depending on the fabrics that you choose. The pattern CLEARLY states the resultant block is 21". Also clearly, I had no idea exactly how BIG 21" is. I picked out a cute black with pink polka dot fabric for the center 6-point star without ascertaining if I actually had enough of this fabric for all 6 diamonds. It turned out that I did not. Sigh. I *did* have enough for 3 diamonds, which is good because the pattern calls for half-stars as well. Now, for this .. and all subsequent stars ... I have deliberately *not* put them on a background fabric. I haven't the faintest clue what the background fabric should be ... and honestly, at this point, I don't need to decide that. I will wait until I have all the full stars, half stars and quarter stars to see what kind of background would best suit them. This is the first star I made .. a half star. * Stash Busting Stars ... numbers 2,3,4. 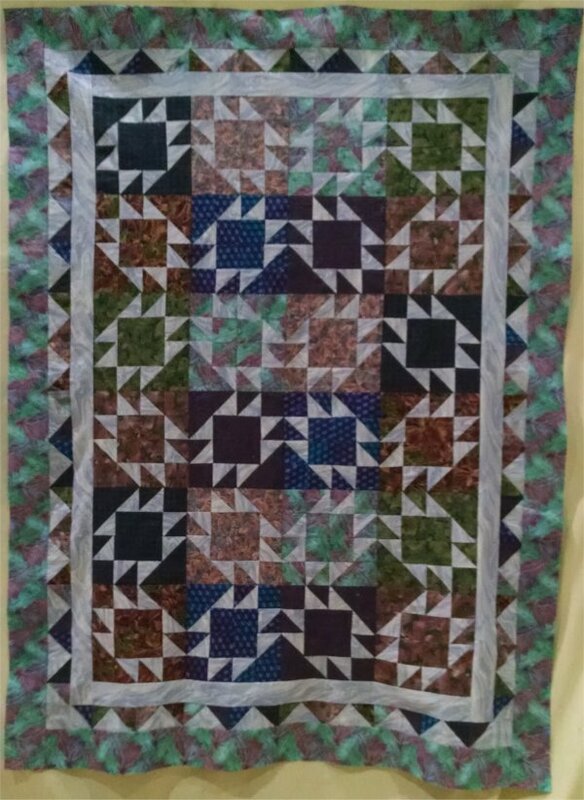 I had made a very similar looking quilt in 2015 but this one appears more "stretched out". I liked the look of the spirals wrapped around a column that I decided to make another one. Where the previous pattern was made entirely of half-square triangles and hence VERY easy .... THIS pattern, from eQuilter, is a MAJOR PITA. Holy moley ... each block is made of three segments. Each segment is made of three pieces .... for you math majors, that's NINE pieces of precisely matched segments to create ONE block. I died. Absolutely died. But, I was committed (in more ways than one) and I used another ombre fabric for the wrapped spirals. I also opted to use a different border treatment than that of the pattern's. Although the finished top is quite pretty, I would NEVER, EVER, EVER make it again. It is MUCH too complicated when there are at least two other patterns that offer a similar look in a much easier construction method. Mary Jane Best is the designer of American Legacy Quilts. I seem to remember coming across her patterns at a long-ago quilt show (circa late 1990's) and buying quite a number of them. At that time, pre-cuts such as fat quarters, were just beginning to appear on the market and as such, there weren't too many patterns designs specifically for them. Mary Jane got on that bandwagon very early and all of her fat quarter friendly patterns have the word "Quarter" in the name. When I bought this pattern, I also bought some sushi fabric as the focal point, as well as coordinating solids to compliment the colors in the sushi print. 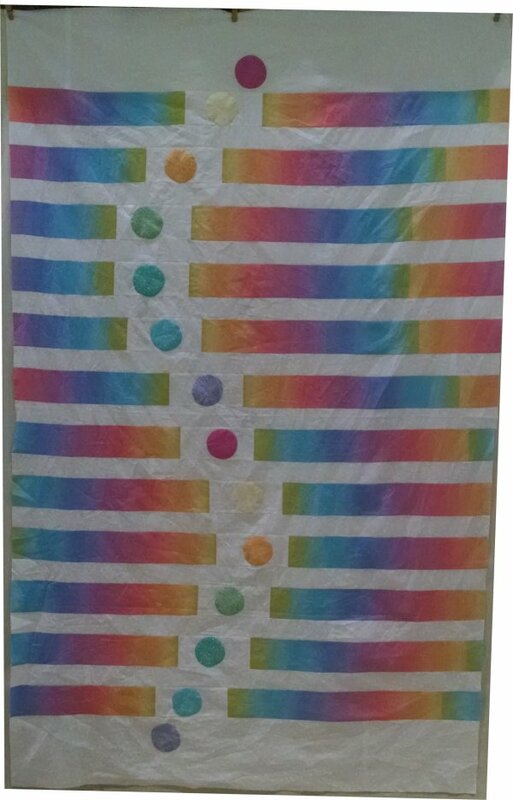 By the time (2016) that I got around to making this UFO, I have tended to make more bed-sized quilts, rather than throws, wall-hangings or small quilts. But, seeing as this series of patterns is based on fat quarters, it necessarily limits the size of the resultant quilt. In the pattern directions, Mary Jane has specifically said that she had geared this series for the beginner quilter. As such, many of the pages contain useful explanations of why things are done in a particular way but were completely irrelevant for me. While I applaud and understand the purpose of her series of patterns, I also think in trying to make it simple for the new quilter, the way the directions are written are unnecessarily more complex than they need to be. Additionally, these patterns call for a LOT of half square triangles. 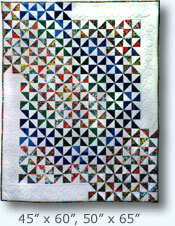 Mary Jane directs the quilter to make them one at a time, using the "draw a diagonal line on a square and sew a seam on either side of the diagonal" method. That's dandy if all you need is a SMALL amount of half square triangles. But for these patterns, you need A LOT. Honestly .. a LOT of half square triangles. 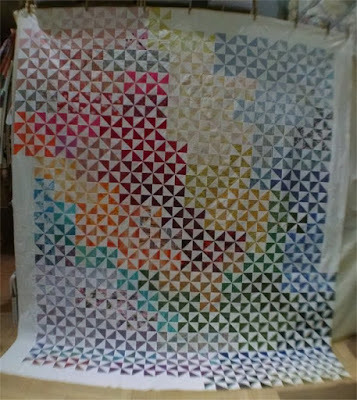 In my opinion, it would have served the new quilter much better to simply teach the grid method of making a whole bunch of half square triangles at one time. But .. that's just my opinion .. and the way I made them. 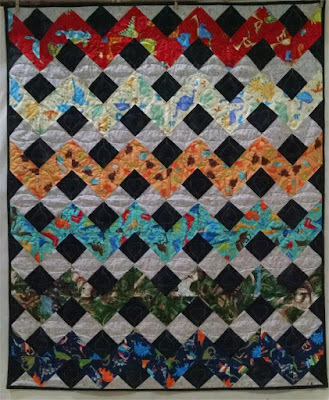 Another half square triangle marathon from Mary Jane's fat quarter friendly quilt patterns. This top was made from a fat quarter bundle that I bought from the Pincushion Boutique. The Pincushion Boutique used to be a brick-and-mortar store in Davis, CA, where I had taken some classes. They are also regular vendors at many of the area quilt shows. They feature "Sweet Treats", which are coordinated bundles of fat quarters in the most astounding, luscious fabrics you could ever see. Their taste in fabric selection is truly above and beyond anyone else's. Some time ago, they gave up their physical store and now are online and quilt show vendors only. I'm slowly slogging my way through this UFO bin and all the "kits" that I have put in there. I had made a previous one of these in 2013 for a daughter who lived in an apartment and didn't have space for a real Christmas Tree. My other daughter, who also lived in an apartment, complained that I didn't love her, that I loved her twin better and that she was inconsolable. This happens ALL THE TIME. Honestly. If it isn't that, it's complaints about how "she's breathing my air". 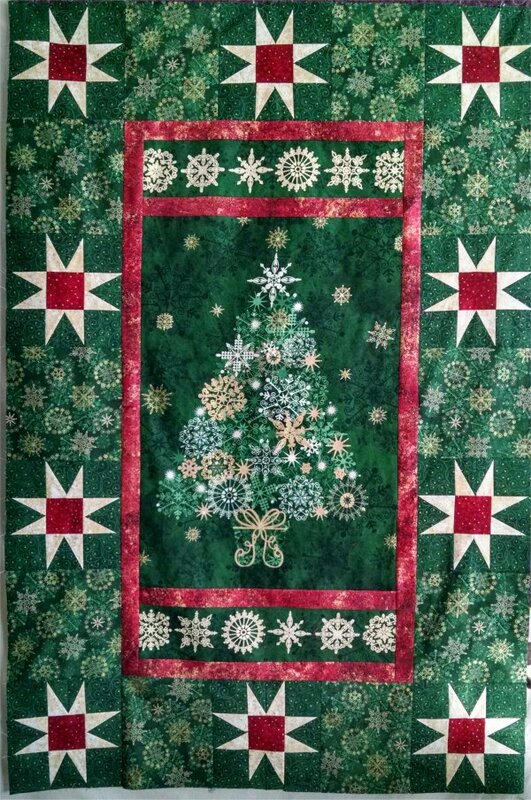 So, I bought another panel (the Christmas tree) and the coordinating fabrics, finally quilted the second version and mailed it off to her. I held my breath until she assured me that it had arrived safely. I *always* worry when I mail quilts. 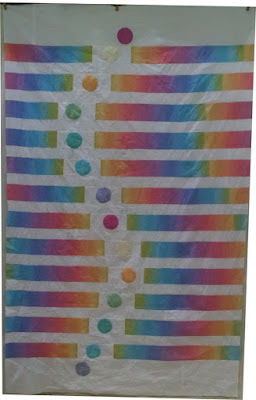 Somewhere on the internet, I had seen a quilt made from Dresden Plate wedges that looked like lollypops. I kept that picture in mind for "sometime". Well, when I was cleaning/organizing my sewing room (again), I came across a piece of fleece yardage that was pink, green and brown circles. It occurred to me that the lollypop circles, done in coordinating colors, would be a PERFECT top for this fleece. 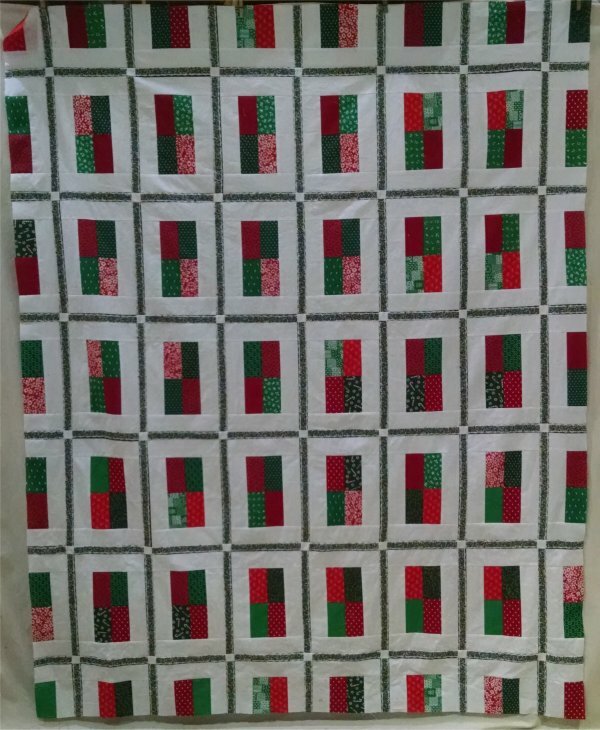 Furthermore, I could short-circuit the quilting process if I used the fleece as the backing for a self-mitered blanket! So, I pulled pink, brown and green fabric along with some ecru background fabric and began making the Dresden Plate circles. 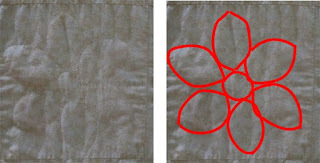 I had used the wedge template recently when I made the Dresden Plate flower in the Minnie Mouse quilt (mentioned above). So, I confidently started to make the lollypop Dresden Plates. Only, for WHATEVER REASON, my blades were NOT coming out correctly. To this day, I have no idea why. The template was perfect for the Minnie Mouse quilt, but all the Dresden Plates I was constructing for this top were NOT laying flat. I fiddled and I tweaked and I cut them out of paper to make sure that the template really was accurate .. it was. The only thing that I can think of is between a SLIGHTLY inaccurate seam allowance (which I did adjust 50 ways to Sunday), perhaps a SLIGHTLY thicker thread than I normally use and maybe not being 100% spot-on during the pressing ... the Dresden Plates simply were coming out wrong. They *all* needed to be adjusted to lay flat. I was very, very annoyed. I'm sure you're all familiar with the self-mitered blanket pattern .. it's all over the place for free. 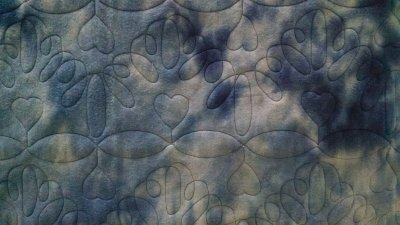 The Missouri Star Quilting Company has a good video tutorial on how to do it. However, every single tutorial, either video or printed, has you make this blanket as a square. They take the two fabrics you're going to use and make a square out of it. Obviously that leaves a scrap remnant leftover. That's fine for your scrap bins but it just annoys the heck out of me to do that. There is no reason on God's Green Earth that you can't use the same construction technique WITH A RECTANGULAR piece of fabric! Which is exactly what I did for this blanket. I merely straightened the edges of the fleece and made the piece top the appropriate dimensions to make it work for the self-mitered construction. When you make smaller versions (like 36"x36"), with both layers of flannel, the layers of flannel will tend to stick to each other through laundering. I wasn't so sure about this larger size, especially since one layer was fleece and the other layer was cotton. 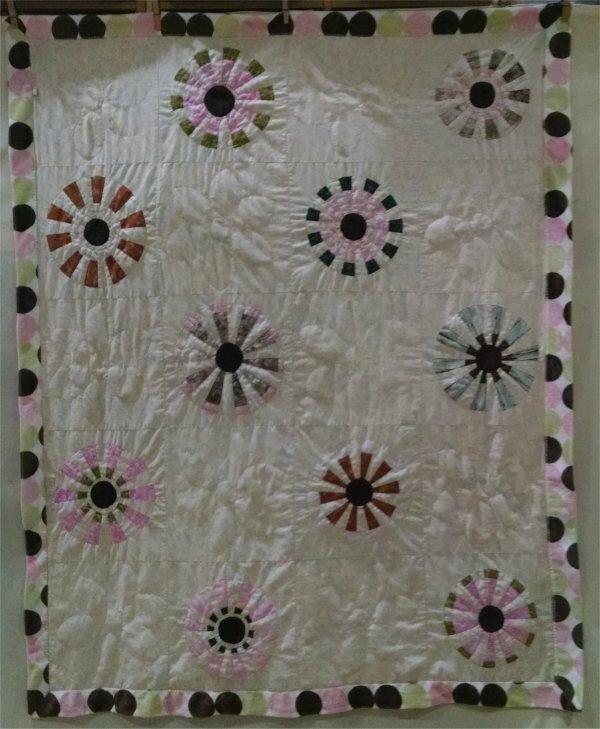 So, once the blanket was completely stitched, I loaded it as a single layer on my longarm machine and quilted 9" Dahlia flowers in the plain fabric squares. In this manner, the two layers will be permanently fixed to each other and won't bubble or shift when it goes through the wash. 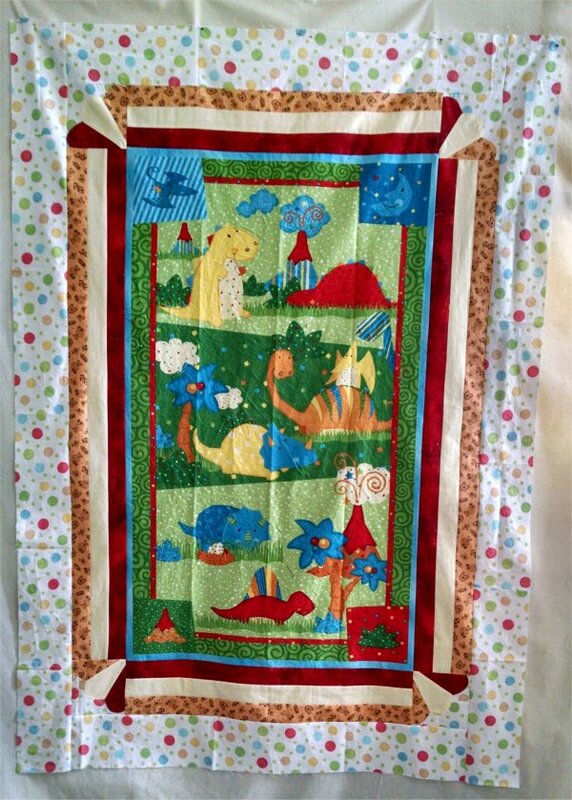 Remember the Minnie Mouse quilt? Well, 2 year old Senia has a 4 year old older brother. We can't have one child getting a surprise present in the mail and not the sibling! From Mr. Pirate's niece, I learned that Ari likes dinosaurs. That's not a design that I normally have in my stash :-), so once again, I scoured the internet and obtained a bunch of dinosaur prints on different color backgrounds. 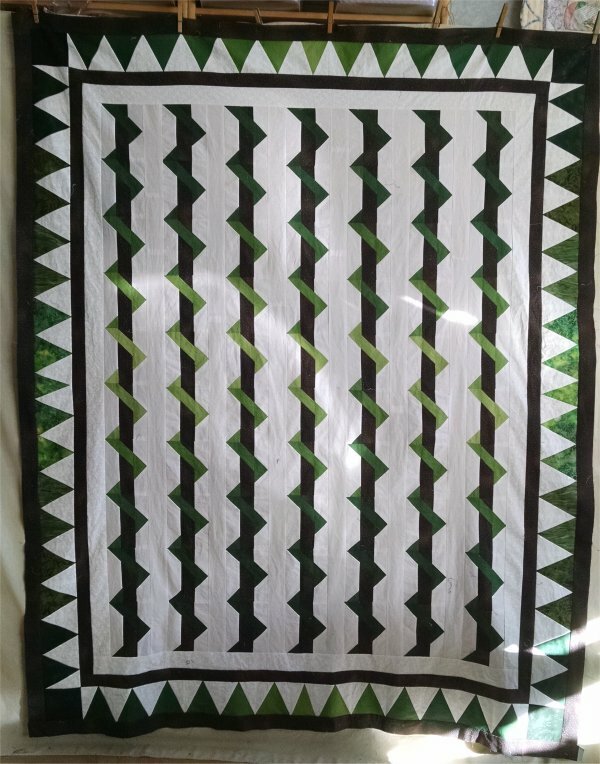 I chose to make a chevron (zig-zag) quilt with each chevron being a different color. I used a mottled fleece as the backing .. no batting ... and I just love the way the fleece shows off the stitching! 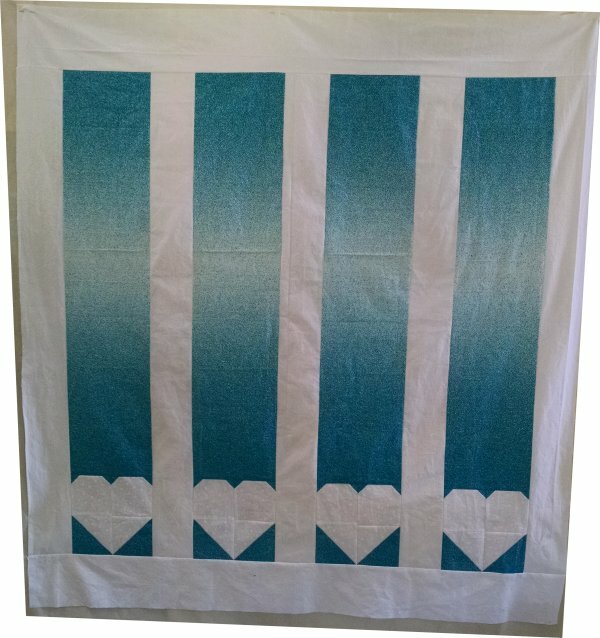 The ecru zig-zag has ovals quilted horizontally while the adjacent black squares have hearts. 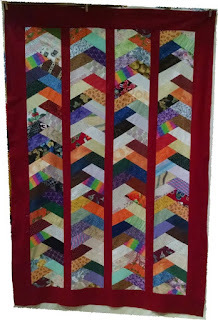 The chevrons were all quilted in simple loops in a matching color thread. and now? Continuing with the NEXT UFO in the bin!